The need for established standards of post graduate education and training of medical physicists is clear. The complexity of techniques in diagnostic imaging as well as in treatment simulation, planning, and dose delivery in radiotherapy has increased significantly in just the last 5 years. A few years ago, the hardware and software that is currently being used routinely in hospitals and clinics across the country today was then found only in academic institutions. In radiation oncology, terms that were known to but a few medical physicists 10 years ago are used routinely today, such as “multileaf collimators,” “collapsed cone convolution algorithms,” “image-guided radiation treatment,” “dose-volume constraints,” “simulated annealing optimization,” as well as “respiratory gated planning and treatment.” In diagnostic imaging, recent advances include com- puted radiography, direct digital radiography, multi-slice computed tomography (CT) scanning, CT fluoroscopy, CT–magnetic resonance imaging (CT–MRI) co-registration, and three-dimen- sional imaging. In nuclear medicine, positron emission tomography (PET) imaging and PET–CT are rapidly finding routine use in patient care. It has never been possible to learn medical physics by unstructured self-study or by observation alone. It is now no longer possible to become a fully competent, qualified medical physicist through on-the-job training, even under the mentorship of a single, experienced medical physicist. Over the past few years, it has become increasingly clear that the training standards and documentation associated with accreditation are needed for proper training of individuals to be capable of practicing medical physics independently. It is also clear that high-quality training can take place effectively in a hospital setting as well as in an academic environment. 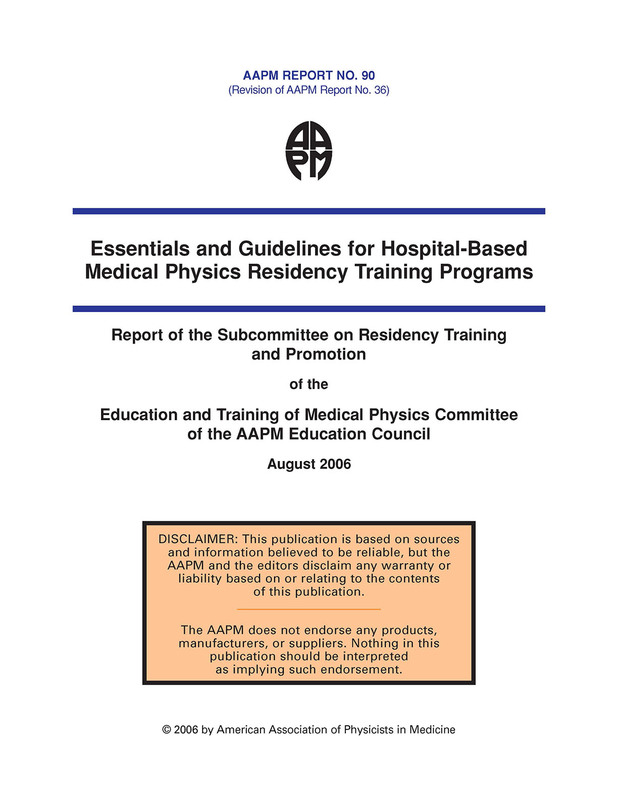 Significant progress has been made in implementing standards for the clinical training of medical physicists since 1992 when the AAPM published the report of the Ad Hoc Committee on Clinical Training of Radiological Physicists (AAPM Report Number 36) enti- tled “Essentials and Guidelines for Hospital-Based Medical Physics Residency Training Programs.” Soon thereafter, the Commission on Accreditation of Medical Physics Education Programs, Inc. (CAMPEP) was formed and these guidelines were adopted for the accredita- tion of medical physics residency programs. Since then, the CAMPEP Residency Education Program Review Committee (CAMPEP-REPRC) has been working with institutions striving to meet these accreditation standards. In 1997 CAMPEP accredited the first residency pro- gram in Radiation Oncology Physics at Washington University. A total of 12 programs in Radiation Oncology Physics and 2 in Diagnostic Imaging Physics have been accredited at the time of this publication. Funding is a critically important aspect of clinical training programs. Significant progress has been made here as well. The AAPM Development Committee supervises the disbursement of several vendor-sponsored training grants in support of medical physics residencies. In addi- tion, funding is available to accredited programs from the Centers for Medicare Services. This funding is in proportion to the Medicare services provided by the institution. Existing medical physics residency programs are demonstrating that clinical service provided by the resident off- sets most if not all of the costs associated with establishing an accredited program. In 2003, the AAPM Committee on the Education and Training of Medical Physicists was charged with revisiting and updating the original AAPM Report Number 36. The Medical Physics Residency and Promotion Subcommittee was formed of AAPM members with extensive experience in clinical, professional, and educational aspects of medical physics. The members of the subcommittee recognized that the recent publication of the AAPM Report No. 79 entitled “Academic Program Recommendations for Graduate Degrees in Medical Physics”* covered the didactic training requirements of a medical physics resident. Therefore, the subcommittee could concentrate on the clinical and professional knowledge needed to function independently as a practicing medical physicist in the areas of radiation oncology, diagnostic imaging, and nuclear medicine. It is the sincere hope of the subcommittee that this revision will serve the medical physics community as well as and for as long as did the original document published almost 15 years ago.